Blurry Bell Battleship Exhale Wunder Under Crops. I like this print. H20 Energy Bra in Harbor Blue. I am debating ordering one of these. Lilac Ready and Go Tank. I am curious about this but I'll wait to try it in the store. Pretty Prism Speed Crops. I have this in my shopping cart but not sure whether I will get. Canada got the Black Swiftly tank but not the LS or SS. The US did not get this. The US got the Pink Paradise LS and SS Swiftly tops. Canada got the Miss Mosaic Rack Pack Bra. Stride to Tide shorts and Tidal Flow Net Top. Did you get anything today? I am still mulling over a couple of things. 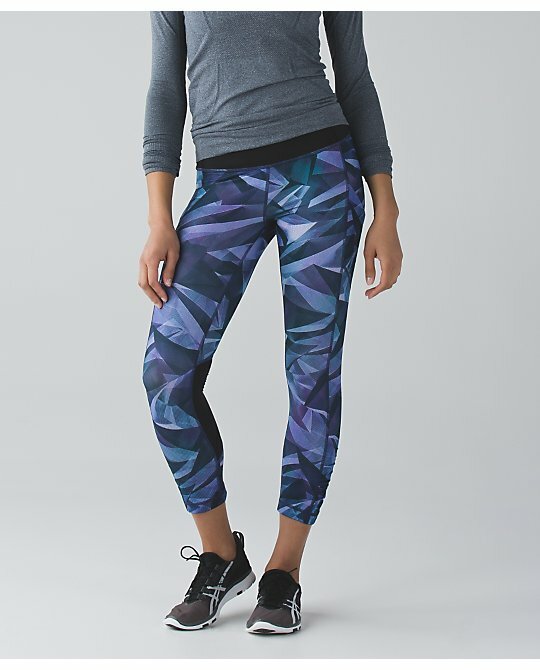 I ended up ordering the Harbor Blue Energy Bra and Pretty Prism Speed Crops. I'll probably grab the Deep Zinfandel Street To Studios. I hadn't seen that yet, Amy - thanks! I knew the prices were very high, though. Picked up the DZ High Times in the store try. Also the lilac energy bra. Wish Lilac came in a CRB! Not thrilled with anything else. The &go line must go. Ugh! Things are feeling a bit schizo to me in lulu land. Nothing really seems to coordinate very well. Not a lot of rhythm or reason in the way items are released, imho. Colors are all over the board. Disappointing, but a $$$ saver for me. I love Speed Crops so much I will probably get those prism ones. I've never had an H20 bra, I really love the blue color. Is it a swimsuit top in the shape of an Energy bra? @ anon 5:54 pm - It's an Energy bra made with swimsuit material. Only like the black swiftly tank, jungle green striped WUs (but likely won't buy as probably would not wear enough to justify price), and the deep zinfandel crops. Agree with yo 5:19 on LLL being all over the place and the &Go line should go. I have no words for that weirdo sweater. It was such a pretty green until I saw the back! I'm really liking the Deep Zinfandel Real Quick Crops. I may have to get these, but haven't pulled the trigger yet. @Karin - they do look nice. I was looking at them myself, tonight. Never thought of tan lines with the swim tops! Good call!!! I was kind of tempted by the DZ Real Quick Crops, but the Full On Luxtreme version of these have gotten terrible reviews. Bunching at the knee seems to be a big issue. 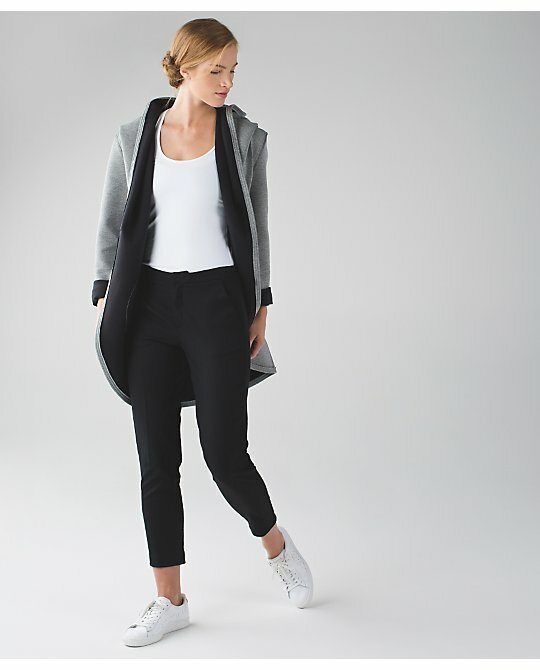 Plus, no side pockets and I don't think I would like a high waist on a running pant. If I could return them, I'd try it, but I'm out of the country, so (effectively) all sales are final and it's just not worth the risk. My DZ Real Quick Crops arrived today and they are wonderful. They are a nice tight fit, high waisted, a 17" inseam which is perfect and yes you can fold them up to expose the reflective strips. These are my first crops with the waistband pockets on the outside so I will have to see how I feel about them after a few wears. There is one on each side plus the zipper pocket in the back. I love the colour and the mesh is just as dark as the luxtreme to you don't really notice the mesh which is fine, mind you I haven't worn them outside yet to see how they look in the daylight. The DZ Street To Studios are tempting but I am hoping they correct the sizing and go back to their original sizing when they first came out. My regular size 4 is now too big in the waist and bum and sizing down is too tight in the calves. I don't know why they changed the fit of these. 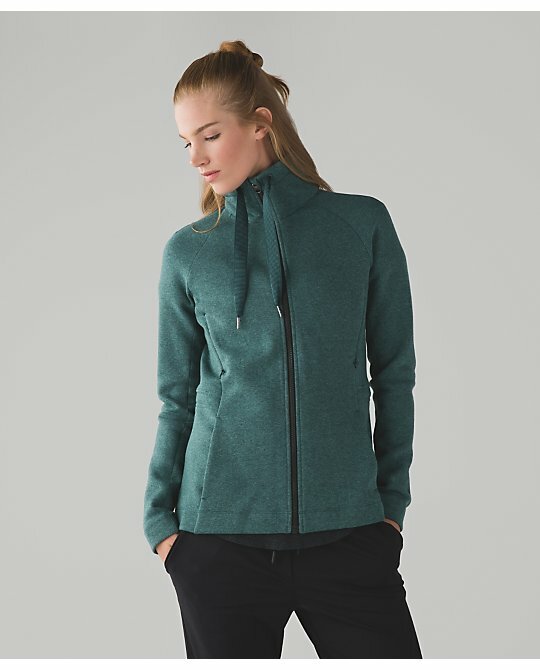 I love that green of the top and fleece but not in those pieces. I am confused though as nice as this deep green and deep zinfandel are why they are coming out as spring colours? I got the striped H2O speed shorts, black H2O energy bra (initially wanted harbor blue until I remembered I have the luxtreme version), and the new FTBW with pink straps. Not totally sold on the H2O stuff since I don't do a lot of water activities but wanted to grab the shorts because I think sizes will sell out overnight. FOMO wins again! I ended up getting the Ready and Go tank in Lilac. I think it's so pretty. I really am tempted by energy h20 bra but since their swim line always disappoints, i will wait for some review. If it functions well, i will get it for sure. LLA,Please let us know when youd get it!! @yoginitiff - I will get it on Friday afternoon. 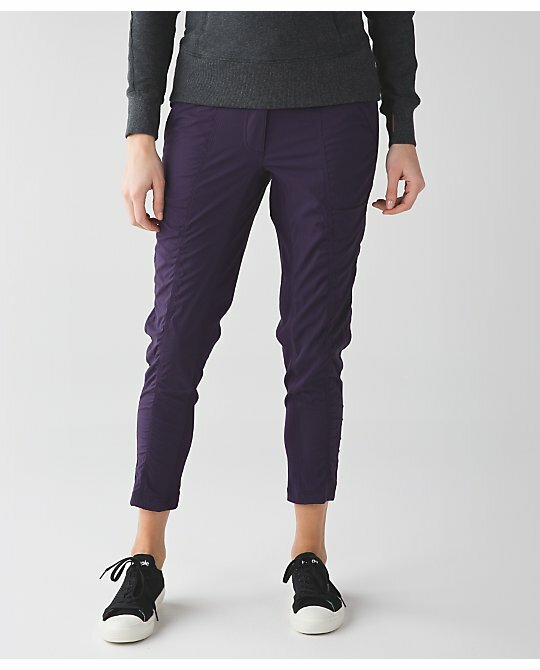 I tried these on and loved the fit and feel but the lack of a pocket big enough for my phone (and thigh pockets, love those) kept me from buying them. 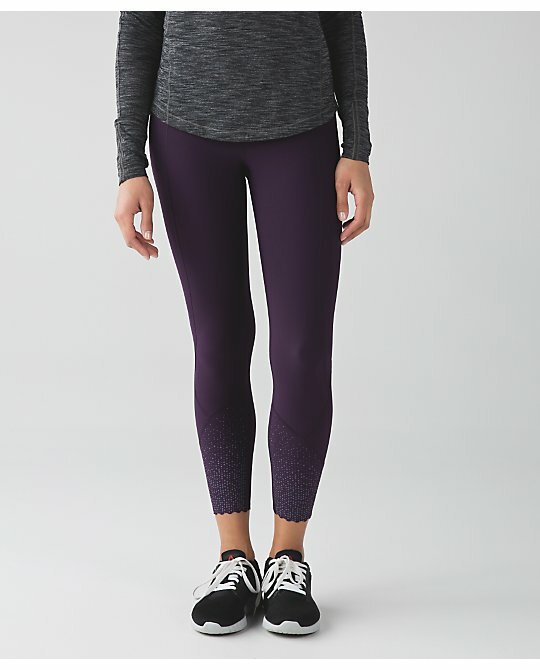 I don't know why Lulu doesn't make many shorter crop styles with thigh pockets! I would also love to have more shorter crops! the 17" is the perfect length for me. also I like it when they add the mesh on the back of the knee. @4:11am Think of them like an unbuttoned cardigan/wrap/light jacket. If it's cold you wear something under and/or over them to go outside, but indoors it's a nice cozy piece that adds balanced warmth. 6:10 anon--my size actually did sell out overnight, so I'm glad I ordered them when I did. The Paradise Camo print sold out quickly a few weeks ago, so it seems that there is quite a bit of interest in them, even with the higher price tag. the speed tights are the only thing that looks semi decent. I did not buy anything. The rack pack bra I had already gotten the orange one and I worked out in it and take back all the bad things I said about it. It fits a bit more snug than the run stuff your bras that I have, I think it is because it is new and I haven't washed it as many times as my RSYB. I bought a reversible (pink ) 5mm mat and I really love it for my super sweaty Ashtanga classes. I can't believe all the negative reviews on the lulu site. The lulu mat is better than my jade mat. The &go dress actually somehow worked well for me. I'm kind of embarrassed to admit it based on how bad I think it looks in most/all of the photos I've seen but on it was comfortable and looked really flattering. I love DZ but bought most of what it came in last time around and really don't need more. 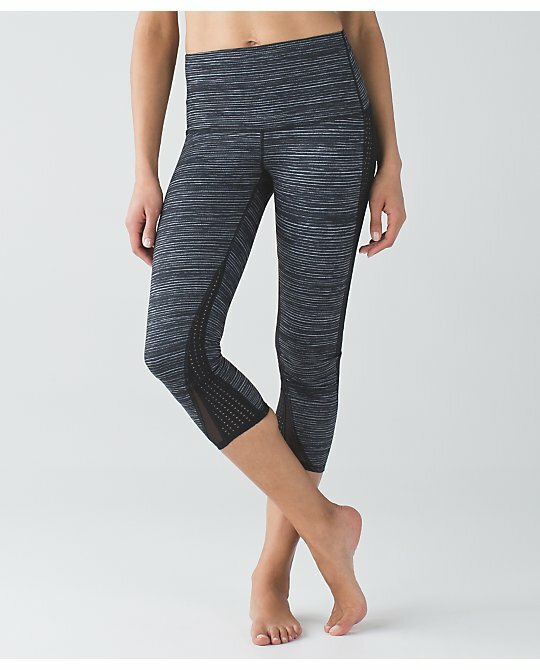 @Actively Petite and 11:59 AM - if you are not familiar with, several years ago LLL had a knee length crop called the Run Marathon Crop. You could check eBay and such. 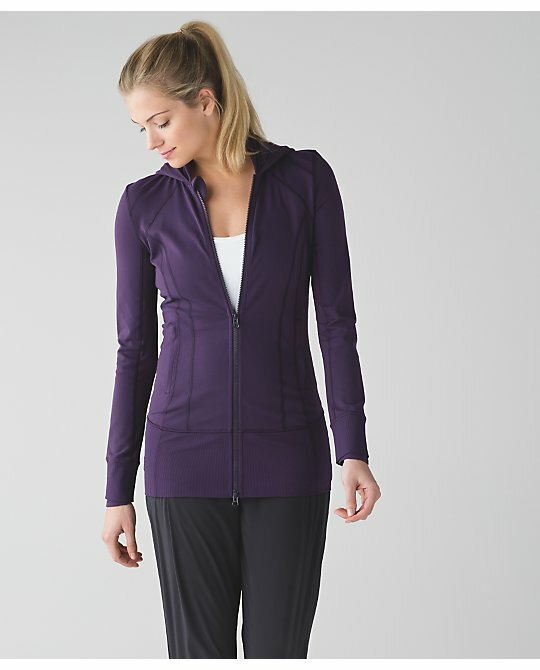 They have deep, side thigh pockets, two deep waistband pockets (high waistband) and a back zip pocket. They re-released them a 1.5-2 years ago. I'm not sure but I don't think the quality was as great for those, from what I remember from reading the reviews. I did not buy a second pair from that release. I have the older version and they are my absolute favourite for longer runs. They also look brand new, well made and of course well taken care of. Hi, wondering how did the dress fit-- was it quite short or tight in the lower half? Does it show belly and hip lumps? @Anon 11:41pm, I usually wear an 8 in tops, 6 in pants, and 10 in dresses. I took a 10 in the endeavor dress to get more length (per usual). It was definitely on the tighter side in the lower half and not as short as it looks online because I am 5'2'', but the 8 hit maybe 3 inches above my knee and the 10 more like 1 inch above my knee. the top is a bit looser so it worked for me having a larger bust (though my shoulders are narrow). So basically I have described my rather odd body type which is maybe why this rather odd looking dress worked for me. I just like lulu dresses because they machine-wash well and pack well, so I will always "try to make it work" with lulu dresses. So, this was worthy as another basic black dress. I didn't like the grey or red grape too much! I didn't like how visible the logo was so I brushed over it in black sharpie. I definitely have some belly and hip lumps thanks to 4 kids and I felt more comfortable in the 10, so a size up from my normal top size. RE: the endeavor dress, sizing up seemed to help with preventing bunching of the kangaroo pocket. haha when I tried it on the ed said "i'm pretty sure it's already sold out online!!!" and I was like... no words. this is not about to sell out especially online with those pitiful photos. I also love lulu dresses. Was eyeing this one as well. Can you tell how the fabric feels? Is it Luxtreme ? Thank you! @Lululover, the Endeavor dress is slightly thinner and drier feeling than Luxtreme, not as thick/shiny as the Swim material on the biggie dot Here to There and black Out of This World dresses IMO. Actually feels very similar feel and matte finish to the black Swim fabric in 2013 (eg Board Balance rashguard). Definitely thicker than 4 way stretch Swift but a similar feel. 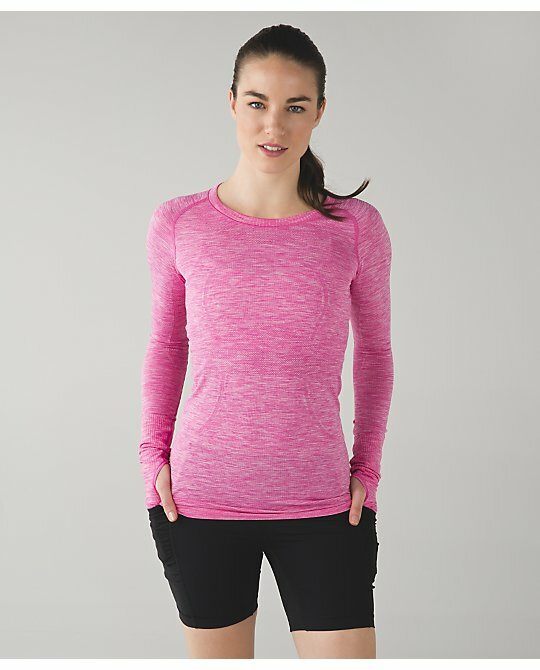 No fabric name on the sales tag but that says it is UPF 50+ and fabric content on the garment label is 75% Nylon 25% Lycra elastane. ^Only referencing the black dress here! Any idea what crops the model is wearing in the pic for the Black Swiftly tank? I am really digging the black on the bottom. @actively - they're Pace Rivals. They're not in North America now but are in Australia if you want more views of them. Love those pace rivals with the black swiftly tank. Lulu really needs to start labelling a "shown/worn with" each of their outfit photos. Tried on the trench in store today. Very loose overall, super cute in the back, very baggy in the front. Very light material, in my opinion not worth the $250. Definitely size down. I saw a skinny educator wearing the wrap and it looked amazing on her. 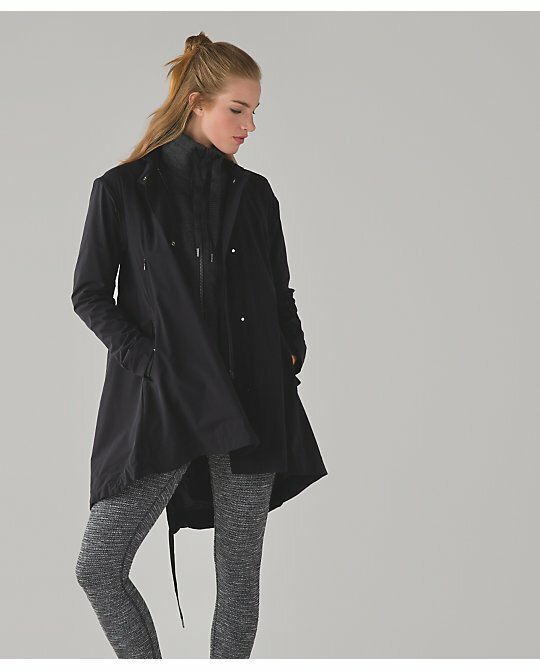 I can see how the wrap and trench can be really cute together. I absolutely love the pace rivals worn with the black swiftly. I found them.on foreign websites too. I wonder if they will come to Canada too? any insight?